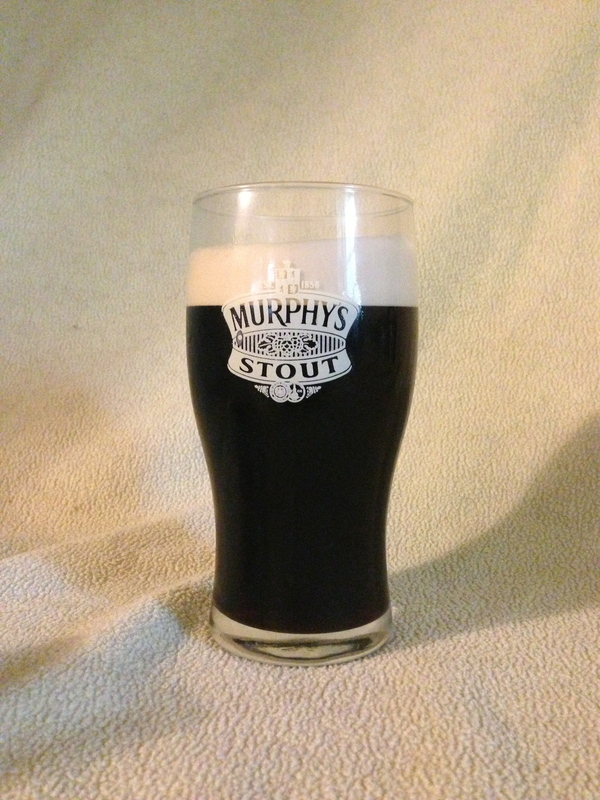 Murphy’s Stout, poured from a nitro widget can. Murphy’s-style homebrews also taste great when served with carbon dioxide only. As a homebrewer and beer drinker, I hope that the current resurgence of interest in session beers follows through to a full-fledged renaissance. My favorite session beer is Irish dry stout, exemplified on the commercial side by Guinness, Murphy’s and Beamish. Although low in alcohol and body, it is full of roasty goodness. Dry stout is a great style of beer for those who want lots of flavor, but also want to enjoy several beers before calling it a night. Dry stout lacks the strength of a foreign export (or imperial) stout, the chewy body of an oatmeal stout and the sweetness of a sweet or milk stout. (In alcoholic beverages, “dry” means not sweet.) But dry stout is not about what is missing — it’s about the wonderful character from the darkly roasted grains, which give the beer a coffee-like flavor and aroma. Without the sweetness, body and alcohol of other stouts, the roasted grain character takes center stage. The key to brewing a great dry stout is to focus on getting the best dark grain flavor, with enough support from the other elements of the beer to round things out. Compared to most beers, dry stouts contain a large percentage (often around 10%) of the darkest roasted grains. If you were to brew a dry stout using water suited to brewing a pale beer, the result would likely be an overly acidic beer that tasted thin and did not show a pleasing dark-grain character. This is because dark grains release acids into the mash and lower its pH. As such, for most brewers, brewing the best dry stout will require some water treatment. Calcium carbonate or sodium bicarbonate are the most common minerals added to a dry stout’s brewing liquor. In the right amounts, the carbonates from these molecules will neutralize enough of the acids from the dark grains to yield a proper mash pH of 5.2–5.6. Determining the right amounts is best done with brewing calculator, such as John Palmer’s water spreadsheet. Your target mineral content for a dry stout should be calcium (Ca++) in the 50–100 ppm range and carbonate (HCO3) in the 150–250 ppm range. If you started with water that lacked any minerals, adding about 1–2 tsp calcium chloride (CaCl2) and 1–1.5 tsp. sodium bicarbonate (NaHCO3) to 5 gallons (19 L) would work. Properly treated, your brewing liquor will cause the mash to fall within the right pH range and the finished beer to showcase the dark grains in the best possible way. Continued in part 2, to be posted June 20th.